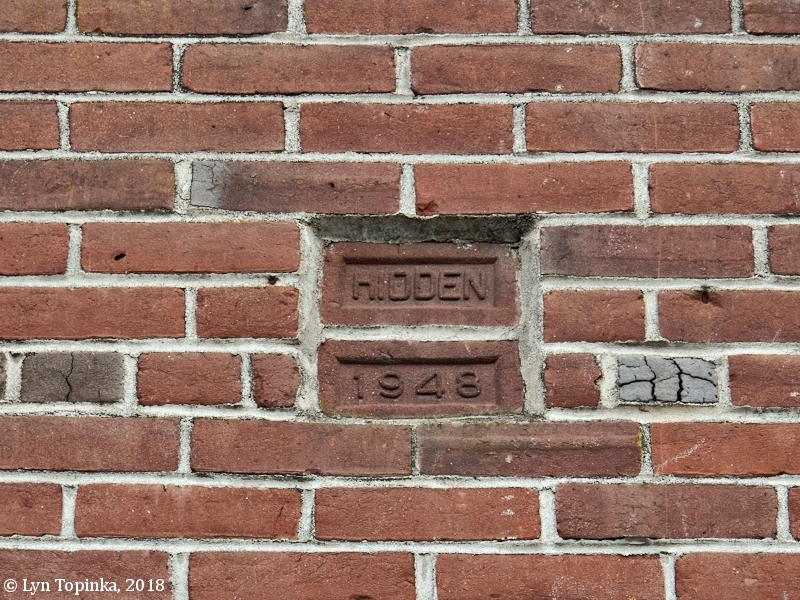 There have been a number of brick factories outside of the city in Clark County, using the stiff-mud, wire-cut process. 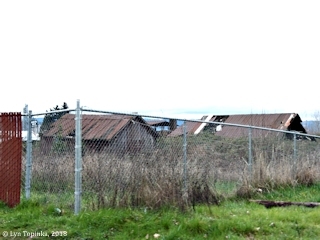 The one at Image, five miles east of Vancouver, was burned a few years ago and has not been rebuilt. The clay from this pit is used by Gladding McBean in their Portland sewer pipe plant. R.B. Muffatt operates a brick and tile plant near Ridgefield, Washington. They have a fine bed of clay. 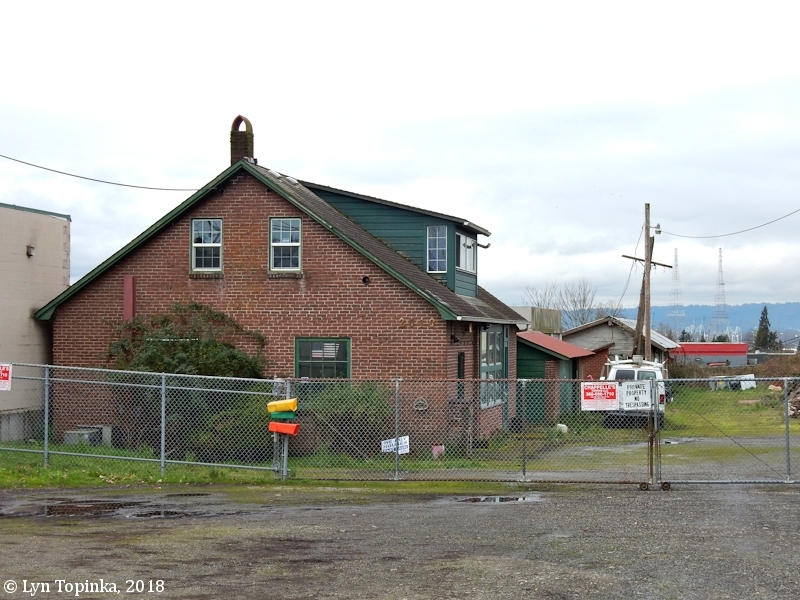 The Molyneux brick yard, a small wire cut plant operated for a few years on Salmon Creek about six miles North of Vancouver. 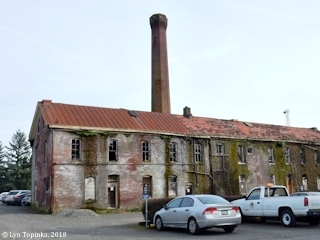 The Farger Lake plant located about 26 miles northeast of Vancouver, have been producing a light-colored wire cut brick. 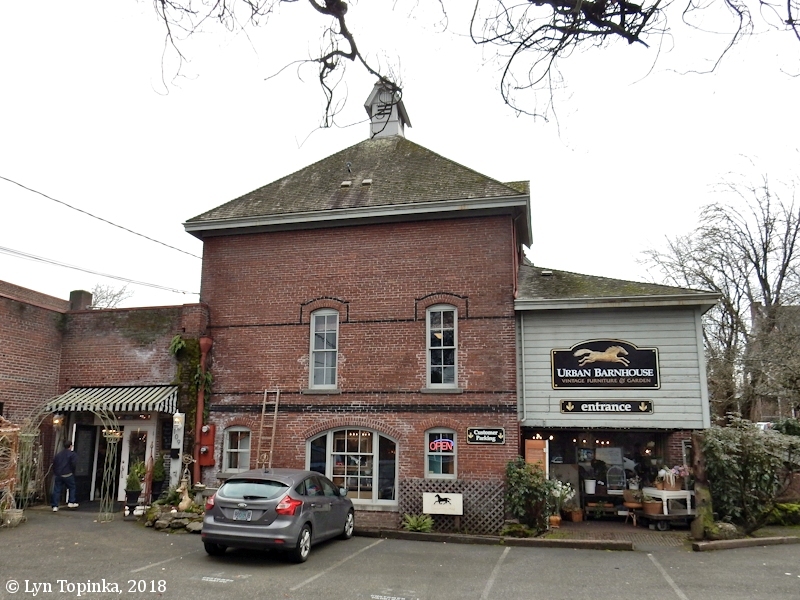 The Portland area for many years was supplied with soft-mud, hand-made brick, some of the yards empoying six or more moulders; later, this was changed to machine made, soft-mud brick. Now they have all passed out of existence and the wire-cut brick has taken its place. There is much to say for the soft-mud brick produced in this locality. They have a beautiful, cherry-red color which is mellowed to a softer tone by age, as shown by St. James Cathedral in Vancouver." Click image to enlarge 1872 E.J. Jeffery brick, Fargher Lakehouse Restaurant, Fargher Lake, Washington. Image taken February 9, 2018. 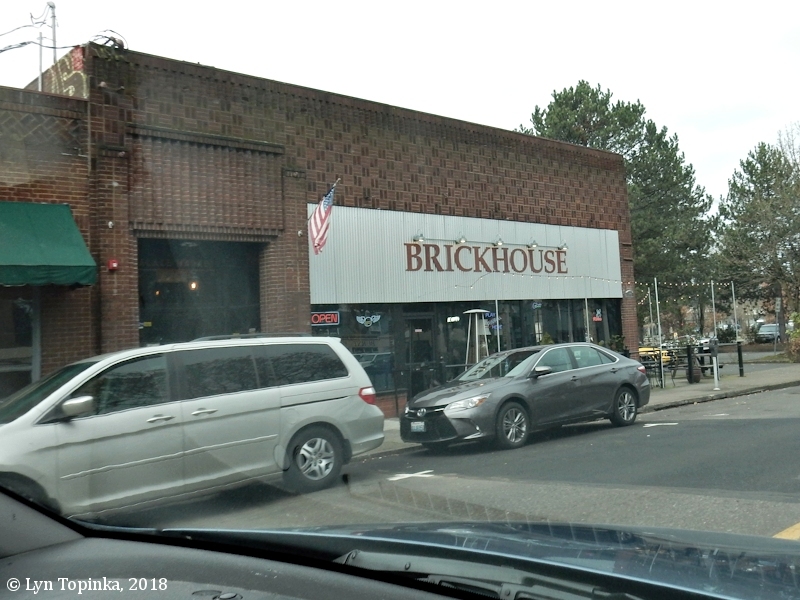 A Portland, Oregon, brickmaker who operated a brickyard in the late 1800s. Click image to enlarge HISTORICAL PHOTO, Clay Pit at Russell Landing (Image), as seen ca.1909. 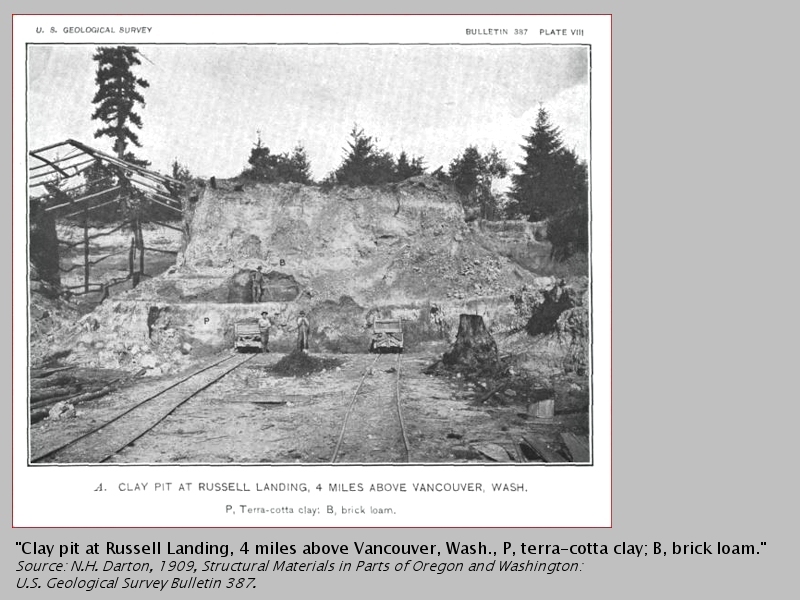 "Clay pit at Russell Landing, 4 miles above Vancouver, Wash., P, terra-cotta clay; B, brick loam." Source: N.H. Darton, 1909, Structural Materials in Parts of Oregon and Washington: USGS Bulletin 387.
p.106 "The Hidden Brick Co., at 2610 Kauffman Avenue, Vancouver, Wash., uses a loamy alluvial silt that overlies the gravelly phase of the lacustrine deposits. Only the upper few feet of the surface materials is used for raw material at this plant. It is probably an alluvial silt deposited during the downcutting of the lacustrine deposits, with perhaps some admixed colluvium. Similar deposits were used during the early history of brickmaking near Portland (Darton, 1909, p.18)." Source: Trimble, D.E., 1963, Geology of Portland, Oregon, and Adjacent Areas: U.S. Geological Survey Bulletin 1119. Two homes of the Hidden family front on the north side of Vancouver's West 13th Street, between Main Street and Washington Street. In 1884 the Lowell M. Hidden home was erected on the northwest corner of W.13th and Main. Then in 1913 the W. Foster Hidden home (Lowell's son) was built next door. 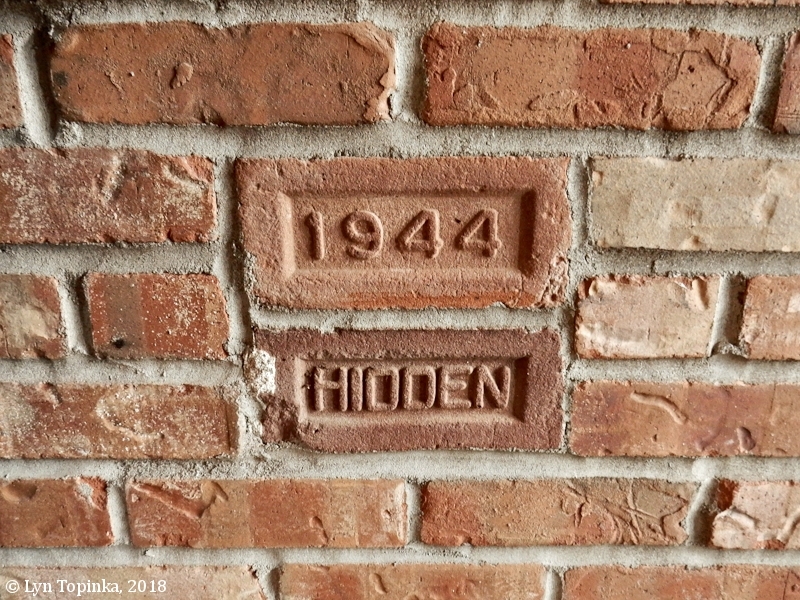 Both homes were made with Hidden bricks. 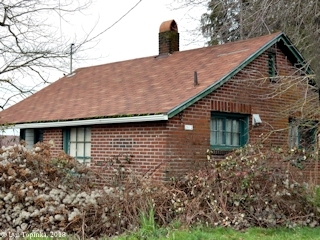 The Lowell home was made with hand-made bricks while the Foster home was made with machine-made bricks. The Lowell M. Hidden House and the W. Foster Hidden House were added to the National Register of Historic Places in 1978 (Person, Architecture/Engineering, #78002737). 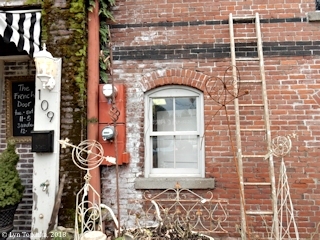 "The Lowell and Foster Hidden Houses are situated side by side on a block in the heart of downtown Vancouver. 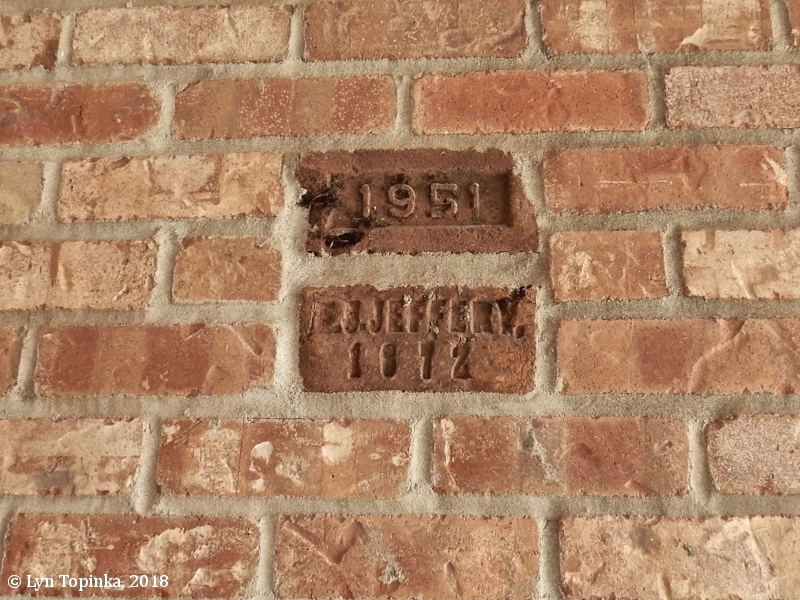 Built entirely of brick manufactured by the Hidden Brick Company, these two substantial homes and their dependencies comprise an intact residential complex. The Lowell Hidden House was erected in 1884 in the Queen Anne style, designed by Lowell's brother Oliver Hidden. Next door, the local architect A.E. Davis executed a Georgian Revival style home for Lowell's son Foster in 1913. Both of the residences now house compatible commercial activites." 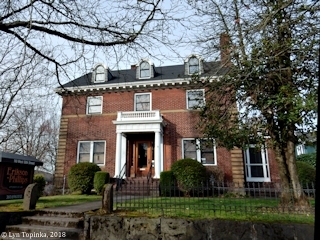 Click image to enlarge Lowell M. Hidden House, Vancouver, Washington. 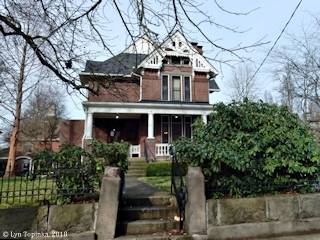 Queen Anne style, built in 1884. Image taken February 7, 2018. 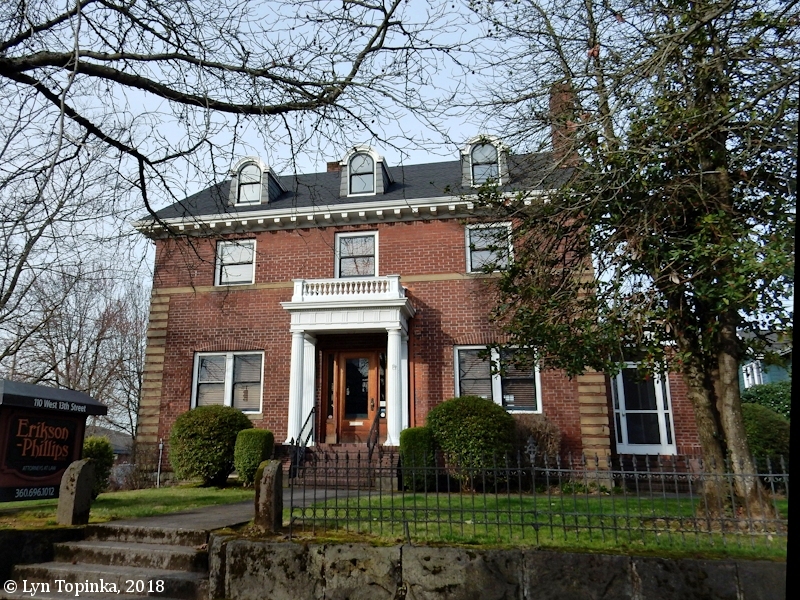 Click image to enlarge W. Foster Hidden House, Vancouver, Washington. Georgian Revival style, built in 1913. Image taken February 7, 2018. 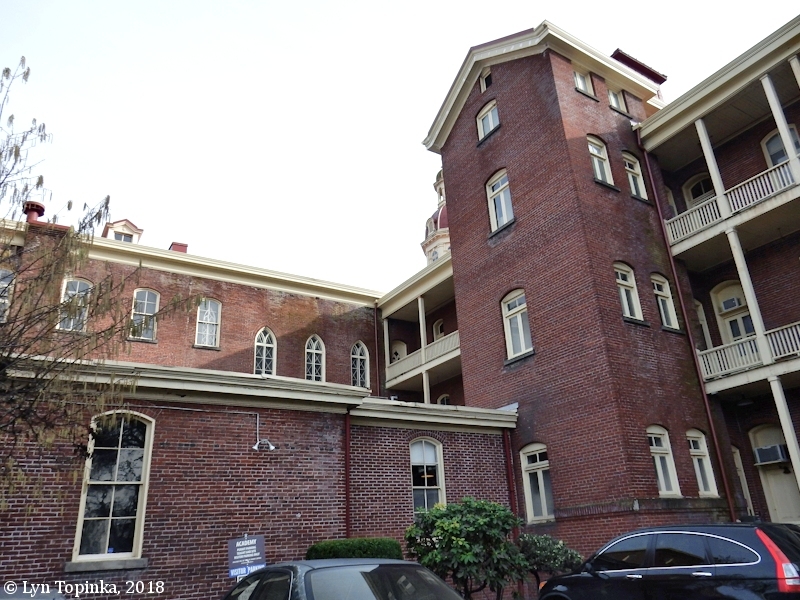 "In the early 1870s Vancouver's Sisters of Providence, a pioneer religious order whose mission in the northwest began in 1856, were finalizing plans for a grand new convent, orphanage and school. The Sisters, however, were sorely in need of a suitable building material. It is believed that Mother Joseph herself convinced Lowell Hidden to establish a brick manufactory. 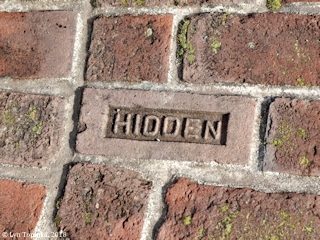 Hidden chose a location about seven blocks from the House of Providence construction site, on 15th and Main Streets near several of Vancouver's many clay pits. 300,000 bricks for the three-story building were turned out in a single season. 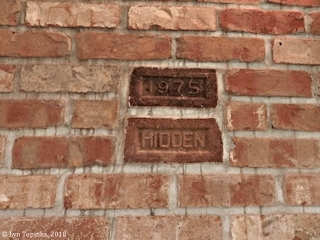 Ten years later the Hidden Brick Company signed another large contract with the Church. Under it they supplied two-thirds of the brick for St. James Cathedral, a handsome Gothic structure situated kitty-corner from the Hidden Family complex on 13th and Washington. 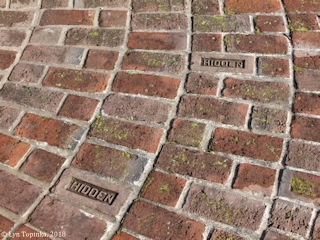 The Hiddens operated a manual brickyard until 1905. Clay was soaked overnight in pits alongside the brickyard, and then shoveled into a pugmill with mixing blades fixed on a center shaft. The clay was thus thoroughly mixed with water and sand, by means of a single horse and sweep. The mixture was extruded a little at a time through a small opening at the base of the pugmill. It was then cut and thrown into moulds by hand. The hardened, moulded bricks were stacked in tiers for thorough drying, and finally hauled to the kiln in wheelbarrows. 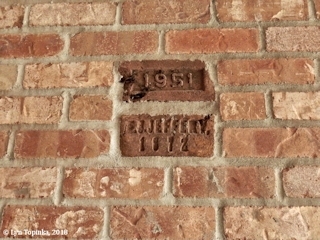 Bricks sold for $8.00 per 1,000 in the early days of the company. During a normal 150-day season approximately 1,200,000 bricks could be produced. In 1905, when Foster and Oliver took over the business, a brick machine which eliminated hand moulding was installed. 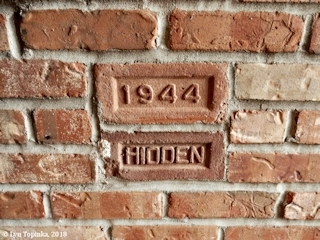 The Hiddens marketed their product widely. For many years bricks were hauled in wagons pulled by Morgan horses. Two wagonloads per day were ferried across the Columbia to Portland. In later years, the company used white Packard trucks. 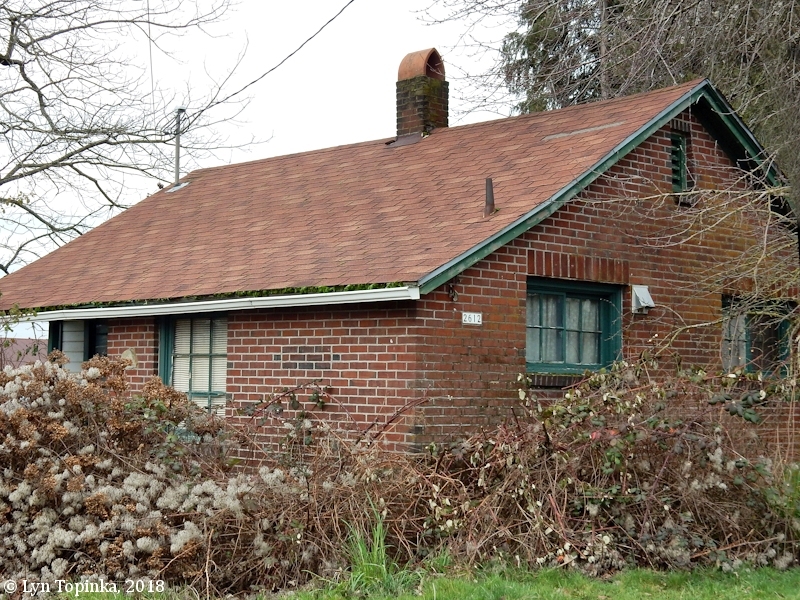 In 1929 when the brickyard moved to its present location on Kaufman and 26th, nearly 60 million bricks had been made at the family yard behind Lowell Hidden's commodious Queen Anne home." "When the Lowell Hidden House was erected in 1884, a small working farm stretched out to the north and west. 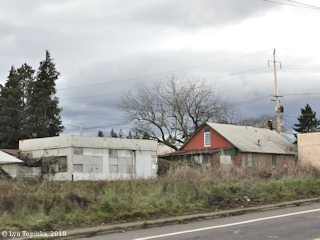 Orchards and outbuildings and unpaved roads occupied areas now covered with asphalt. The Hidden Brickyard was situated directly north of Lowell Hidden's house, across Mill Plain Boulevard where a parking lot and row of one-story commercial structures fronting on Main Street now stand." 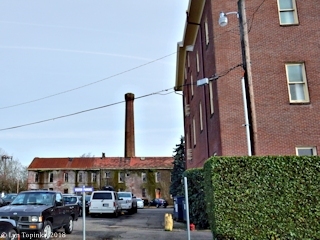 Click image to enlarge View today of the original location of the Hidden Brick Company, Vancouver, Washington. 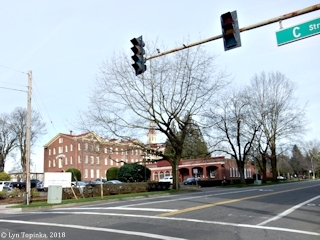 View looking northwest while driving north on Main Street. Image taken February 8, 2018. "Lowell Hidden retired in 1905, but lived another 18 years before passing away in 1923. His two sons, Foster (1871-1963) and Oliver (1874-1940), carried on the business under the name Hidden Brothers Brick Company. 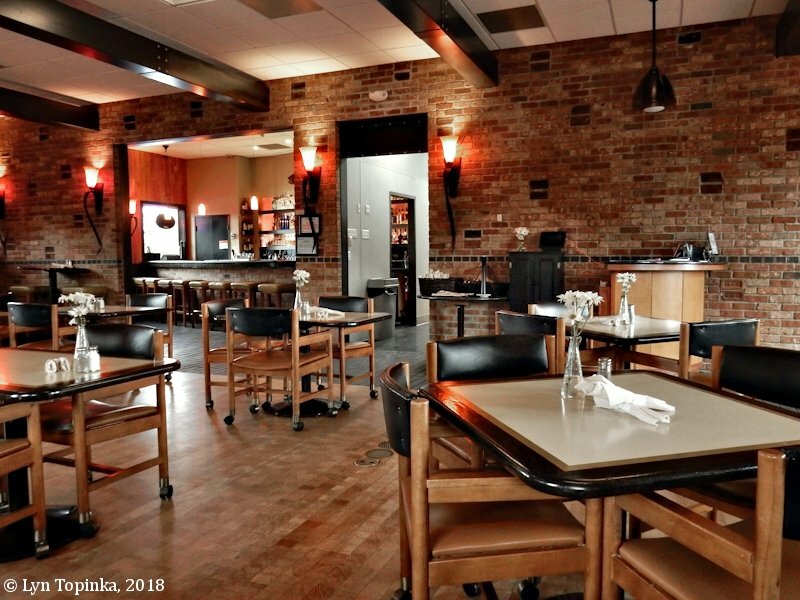 By 1929 Oliver had also retired, and Foster moved the brick factory from his father's original site to a new location at 27th Street and Kaufman Avenue, again calling it the Hidden Brick Company. 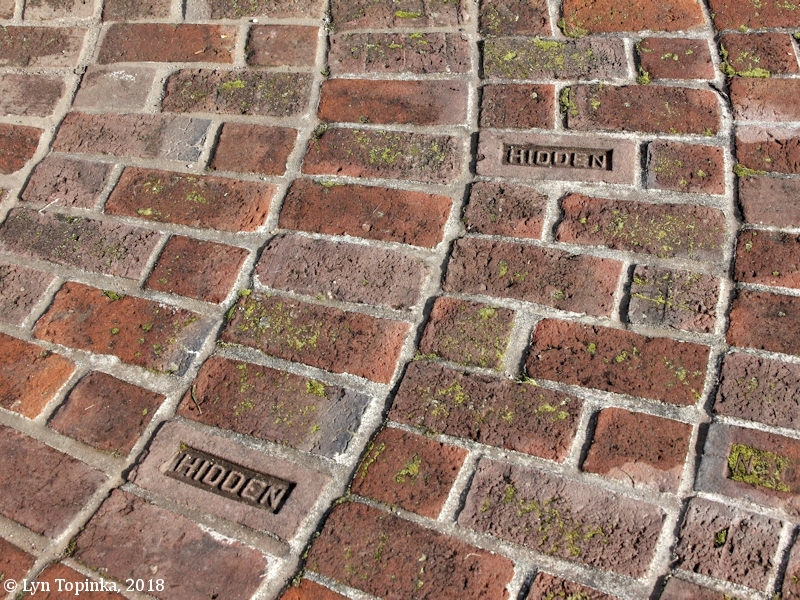 Upon Foster's death in 1963, the operation was taken over by his son, Robert Hidden (1910-1992), who continued to make bricks until finally closing the business in 1992." 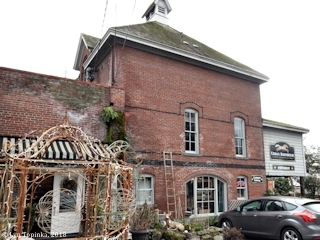 Source: John J. Caldbick, September 1, 2009, "Historylink.org" website, 2018, file #9132, "Lowell Mason Hidden opens the Hidden Brick Company in Vancouver, Clark County, in 1871. 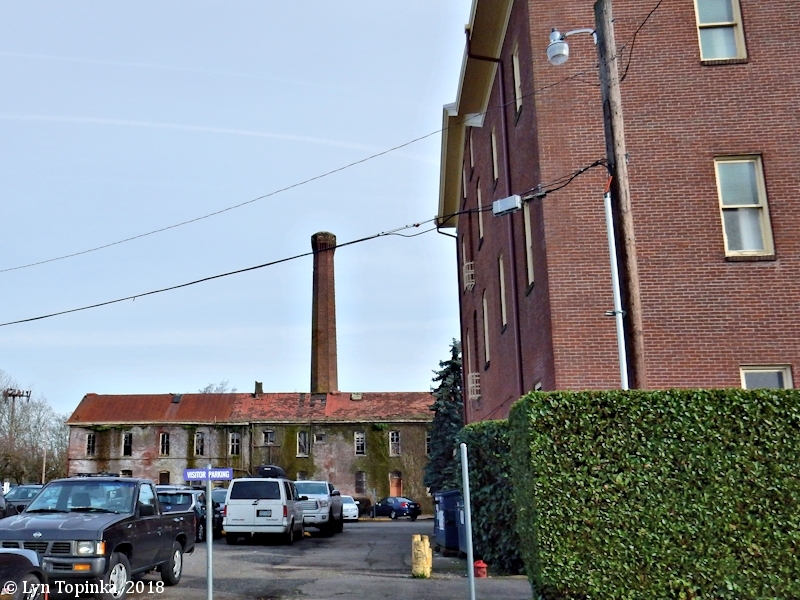 Click image to enlarge Hidden Brick Company, Vancouver, Washington. 26th/27th and Kaufman. Image taken February 3, 2018. Click image to enlarge Hidden Brick Company, Vancouver, Washington. Image taken March 4, 2018. 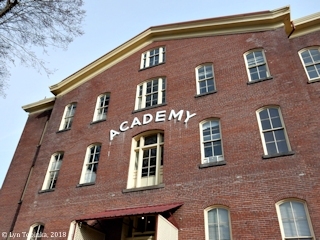 Click image to enlarge Providence Academy as seen from "C" Street, Vancouver, Washington. Image taken February 7, 2018. Click image to enlarge Laundry building, Providence Academy, Vancouver, Washington. Image taken February 7, 2018. "Just northwest of the house is the Hidden barn, an unusual brick masonry structure built at the same time as Lowell Hidden's home. This two-story building with its steeply-pitched pyramidal roof is essentially square in plan. On the barn's west side is an appended frame harness room, thought to be original, and attached to that a small masonry shed where the Hidden family generally stored potatoes and dynamite. 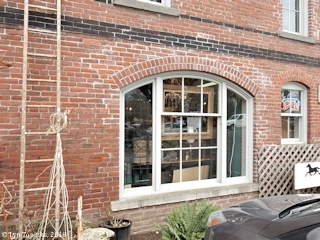 The barn has brick dormers with corbelled, round-arched window openings and a louvered lantern at the apex of the roof. Patterns of coal-tarred brickwork and a number of segmental-arch doors and windows make the barn an extraordinarily handsome dependency. Currently the structure is being sympathetically adapted for office leasing. 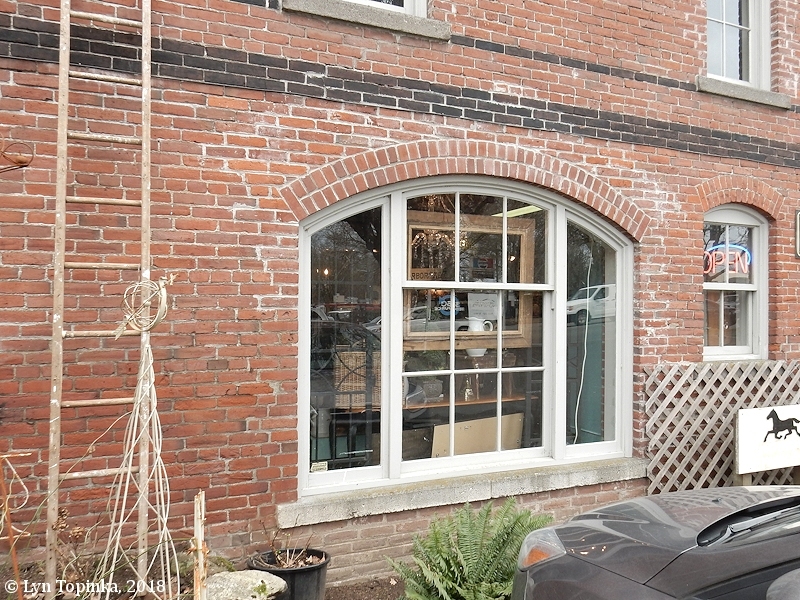 Although some windows are being converted to doors and vice-versa, for the most part original spaces, materials, and surface textures are being carefully preserved." Today the old Hidden barn houses the "Urban Barnhouse", an antiques/country store with a beautiful selection of early items (2018). 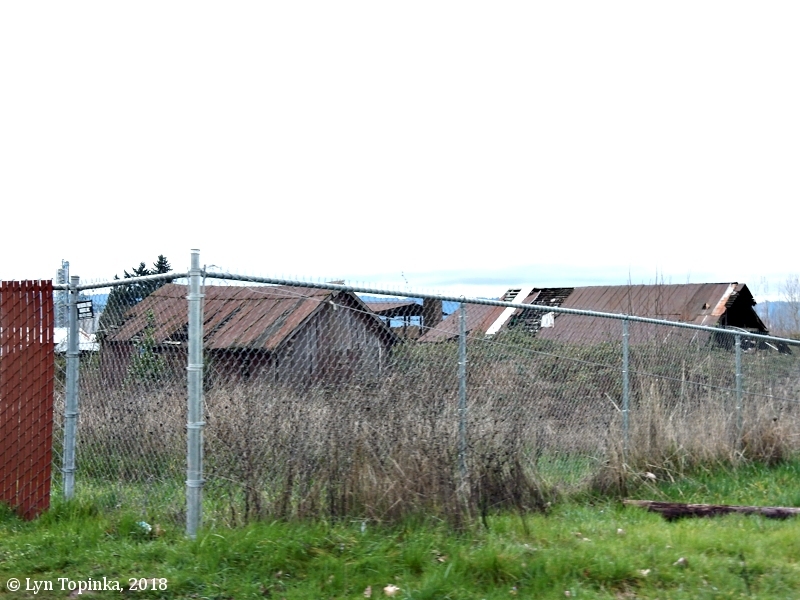 Click image to enlarge Hidden Brick Horse Barn, Vancouver, Washington. 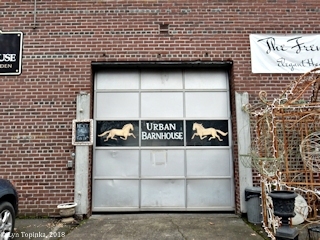 Now home of the "Urban Barnhouse". Image taken May 31, 2015. 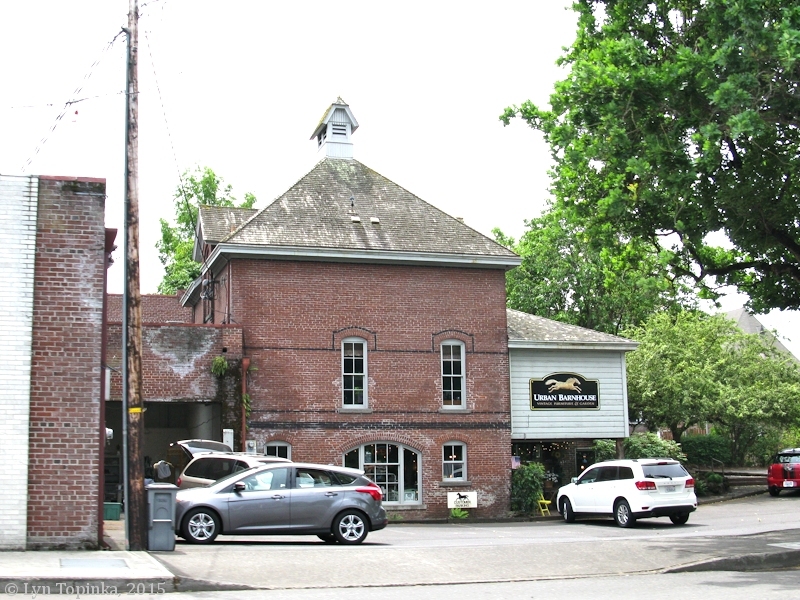 Click image to enlarge Hidden Brick Horse Barn, Vancouver, Washington. 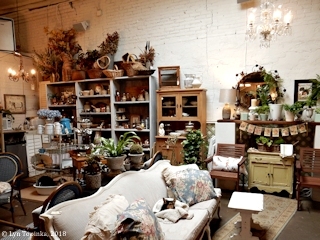 Now home of the "Urban Barnhouse". Image taken February 8, 2018. 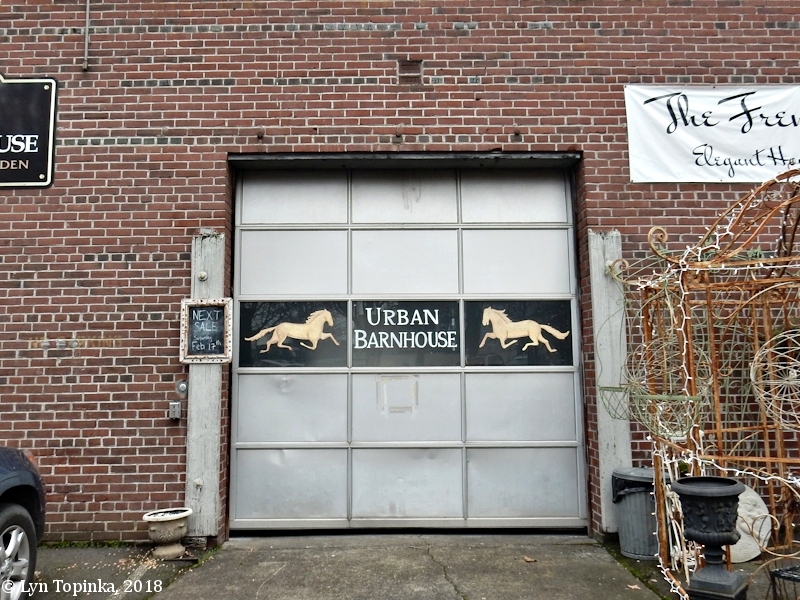 Click image to enlarge "Urban Barnhouse", inside the Hidden Brick Horse Barn, Vancouver, Washington. 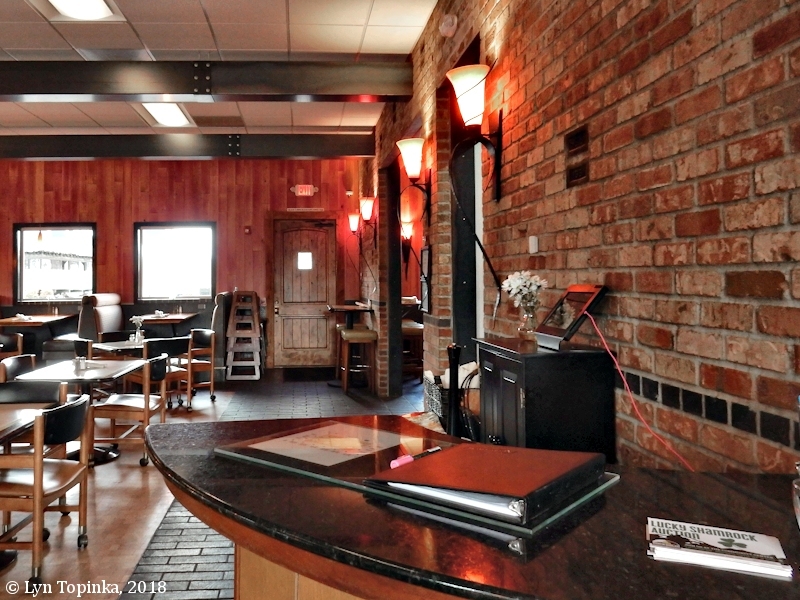 Note painted brick walls. Image taken February 8, 2018. Click image to enlarge Building east of the "Urban Barnhouse", Vancouver, Washington. 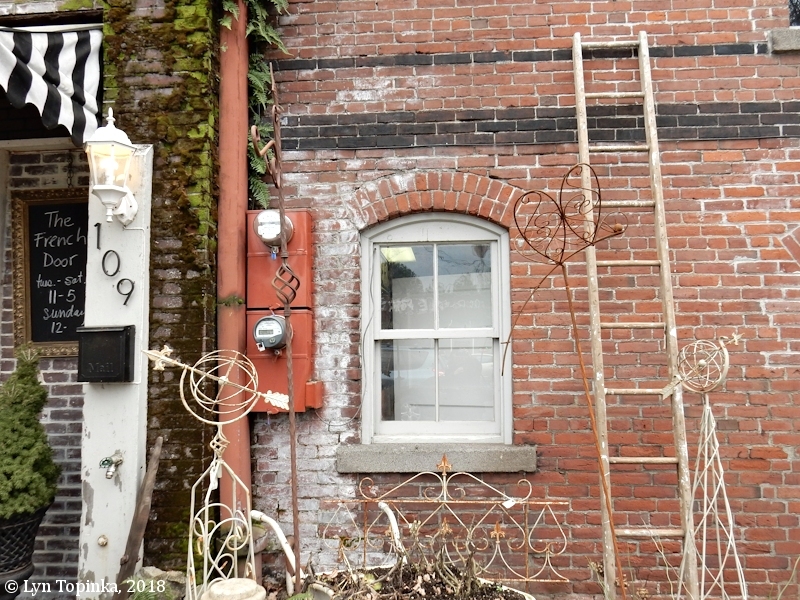 East side of the "Urban Barnhouse" parking area. Image taken February 8, 2018. In 1856 Mother Joseph and the Privdence Sisters from Montreal arrived in Vancouver. In 1884 the cornerstone was laid for the new cathedral. Mother Joseph was heavily involved in the building of the cathedral. 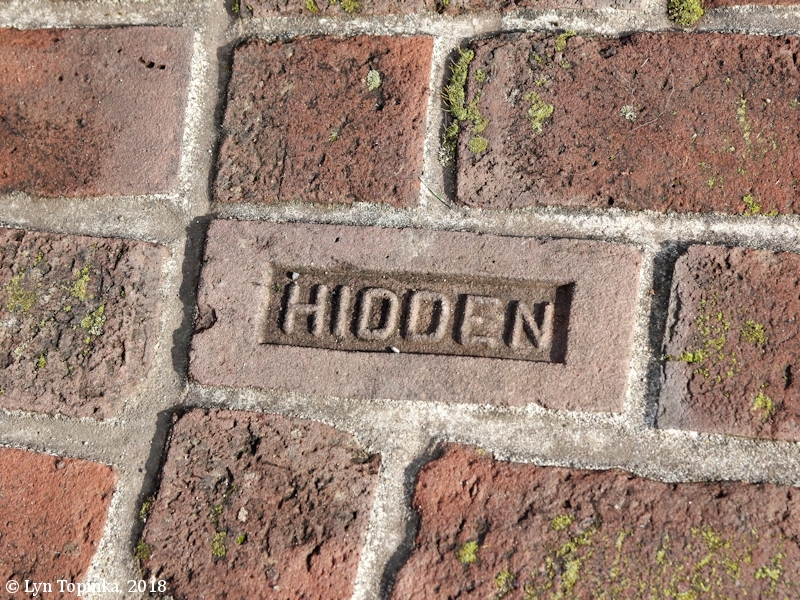 The brick was made in Vancouver by the Hidden Brick Company. The cut stone came from Camas and the stained glass windows were designed and made in San Francisco. The columns are Philippine cedar and the interior is plaster with fir wainscoting. Completed in 1885 ... St. James was the centerpiece of the Diocese of Nesqually. Measuring 145 feet long and 60 feet wide, St. James can accommodate approximately 800 people. In September 1907, the territorial See was officially transferred to Seattle. 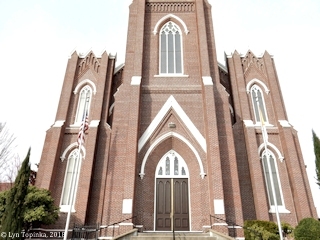 The title of St. James Cathedral was transferred to Seattle with the bishop, and our St. James became a parish church." Source: "ProtoCathedral.org" website, 2018, "History". Today known as the "Proto-Cathedral of St. James the Greater" (2018), the St. James Church was added to the National Register of Historic Places in 1986 (Event, Architecture/Engineering, #86003847). 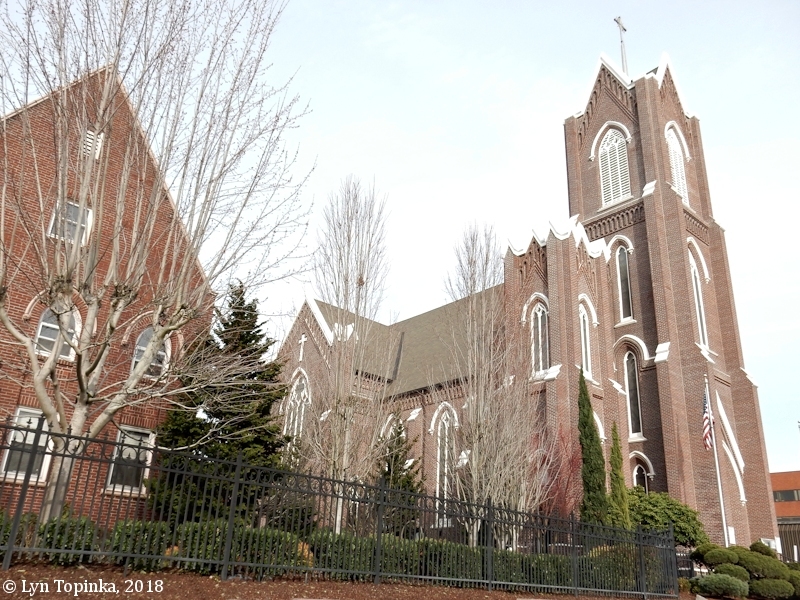 Click image to enlarge St. James Church, Vancouver, Washington. Image taken February 8, 2018. 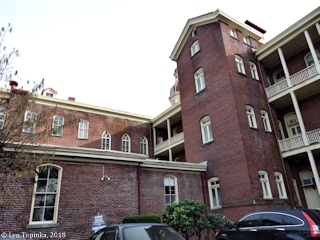 "Although the Vancouver Catholic Library Association was formed in 1865, the direct descent of the present system began much later. 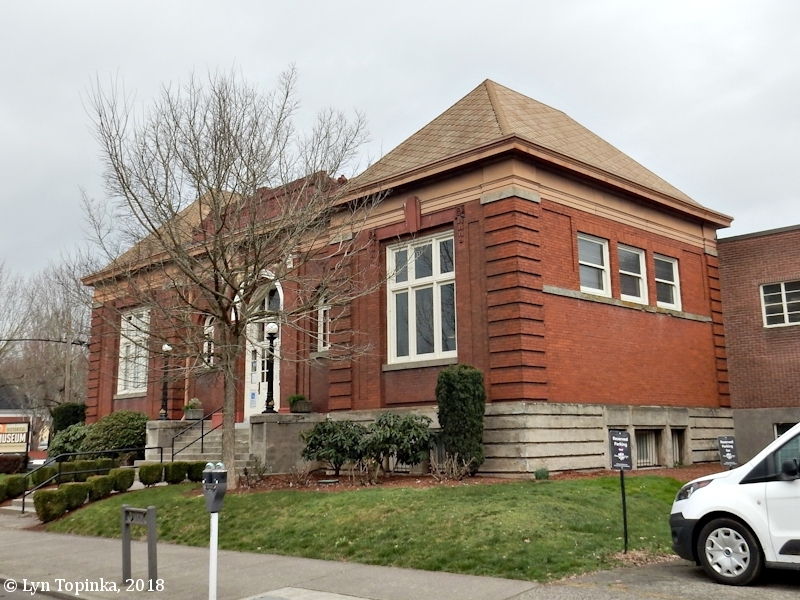 The city of Vancouver had no library until 1909, when this building was constructed. The city applied for and was given a Carnegie grant for construction costs. The land was donated by L.M. 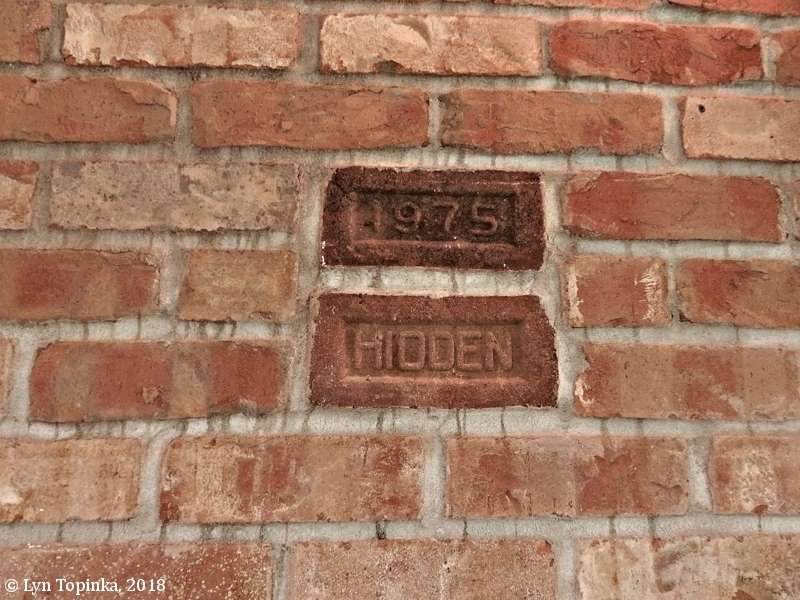 Hidden, a local brick manufacturer whose product was used to construct this building. 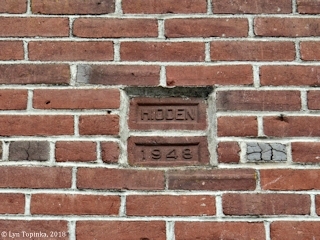 Additions of the same brick were built in 1944 and 1948, but the building was still too small. A new library was built in 1963 and since 1964 the building has housed the Clark County Historical Museum." Source: U.S. National Register of Historic Places "Vancouver Public Library" Nomination Form, 1982, #82004204. 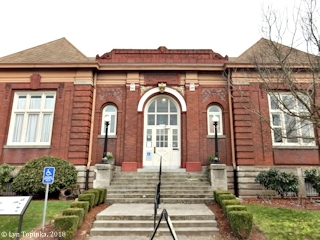 The "Vancouver Public Library", today known as the "Clark County Historical Museum" (2018), was added to the National Register of Historic Places in 1982 (Event, Architecture/Engineering, #82004204). Click image to enlarge Carnegie Library, Vancouver, Washington. Now the Clark County Historical Museum. Image taken February 8, 2018. "On the site of the old St. Joseph's Hospital (built by the Sisters of Providence c.1909 and established by them in 1858 as the first hospital in Washington Territory) stand a new two-story motel and a steak house. Adjacent to the motel on the same block, opposite the Academy grounds, is a modern apartment complex." Source: National Register of Historic Places "Providence Academy" Nomination Form, 1978, (Person, Event, Architecture/Engineering, #78002738). Bricks from the Hidden Brick Company are in a brick circle at the 14.4-acre Grass Valley Park, Camas, Washington. 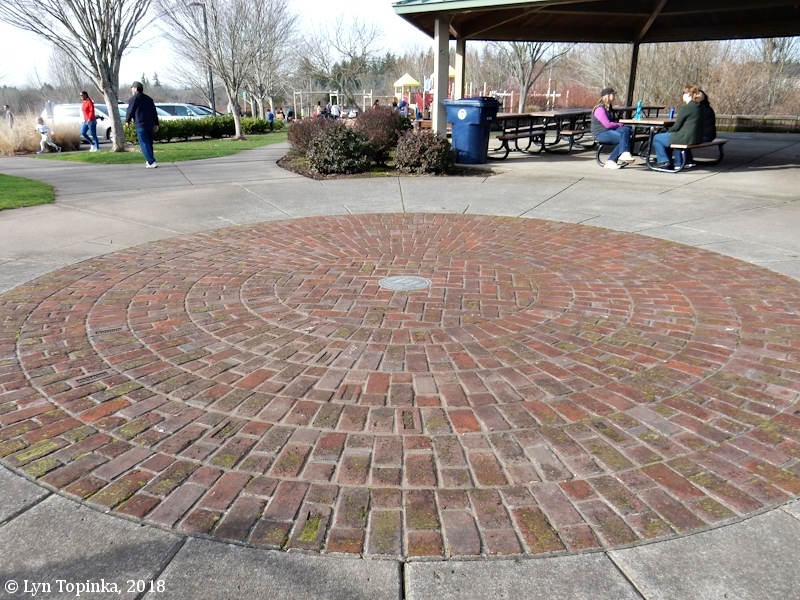 Click image to enlarge Brick circle, Grass Valley Park, Camas, Washington. Image taken February 7, 2018. 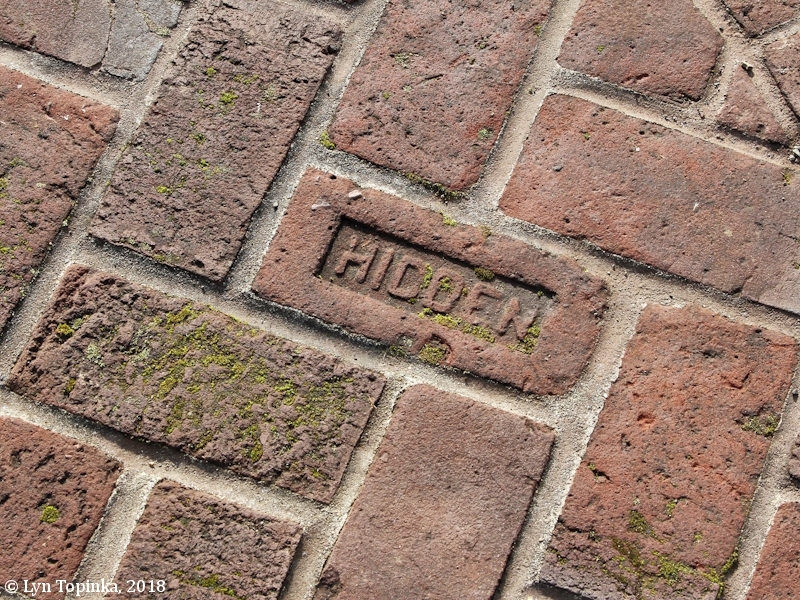 Click image to enlarge Hidden Bricks, Grass Valley Park, Camas, Washington. Image taken February 7, 2018. Built in 2015, the Fargher Lakehouse Restaurant has used "re-purposed" Hidden bricks on an inner wall. The Fargher Lakehouse Restaurant is located in Fargher Lake, Washington, just east of Amboy. 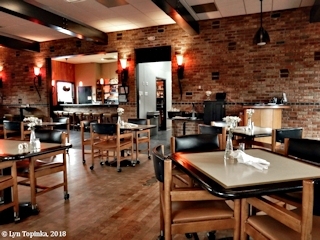 Click image to enlarge Inside, Fargher Lakehouse Restaurant, Fargher Lake, Washington. Image taken February 9, 2018. 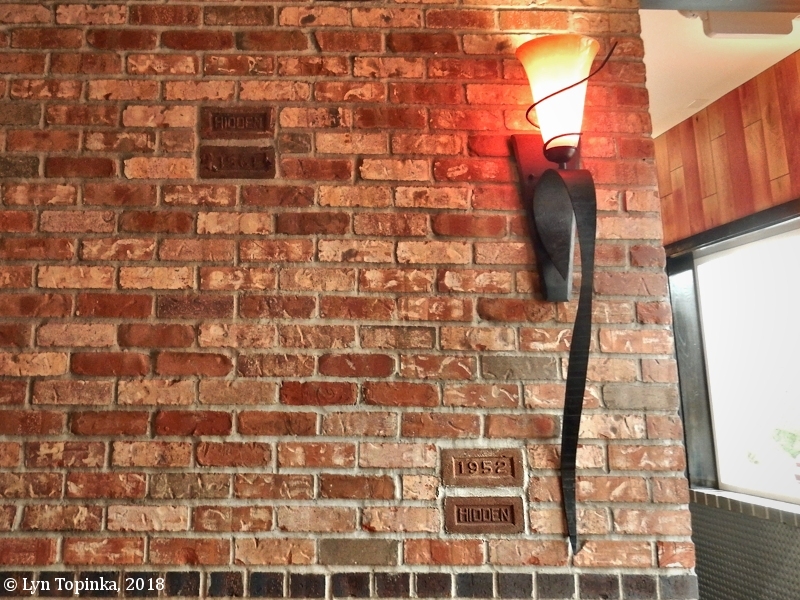 Click image to enlarge Hidden bricks, Fargher Lakehouse Restaurant, Fargher Lake, Washington. Image taken February 9, 2018. Numerous dates were found within the wall. The earliest we found was 1944. Trimble, D.E., 1963, Geology of Portland, Oregon, and Adjacent Areas: U.S. Geological Survey Bulletin 1119.